I've been rather busy and very preoccupied lately. Last night I realised that I needed to rustle up a decent PowerPoint presentation and perhaps some sort of activity. So, I eschewed the blogosphere and settled down to work. I lost the lot. Not really wanting to face a room full of teenagers without any sort of visial aid, I decided to start again from scratch... and finished at about 2:30am. The 40th anniversary of the passing of the Abortion Act is going to be marked on Saturday 27th October by a rally in Parliament Square, London, followed by a march down Victoria Street to Westminster Cathedral where there will be a service of remembrance, healing and hope. The rally starts at 2pm and the service at 4pm. We need to make sure that there are as many people as possible to draw media and public attention to the pro-life cause. More information can be found at the Time for Change website. ...I don't care if it's a children's book. 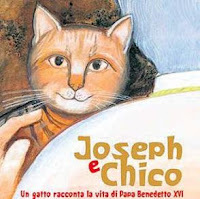 I want a copy: the Pope's life story as seen by his cat. Unfortunately I have to wait for the English translation. 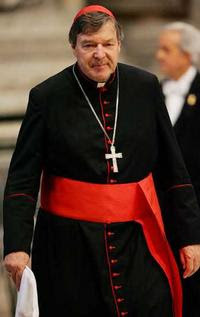 I wonder if it will take as long as the English translation of the Missal? 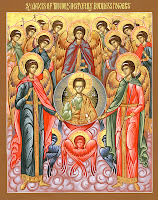 Another of my favourite feasts: celebrating the fact that we have a Guardian Angel each. It's the Guardian Angel's job to help you reach heaven safely, and so, in times of temptation, or when in doubt as to the best course to take, we should always remember that our own angel cannot lead us astray, and we should implore his aid. Oh, and Fr Ray has another excellent post on angels... the writings of St. Bernard, from the Office of Readings for today's feast... 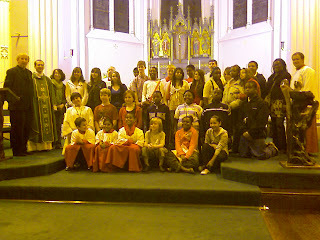 I was planning to put in a few quotes, but Fr Ray has done the lot! Also, I remember posting the lyrics for the hymn to one's Guardian Angel: so I'm linking to it HERE. 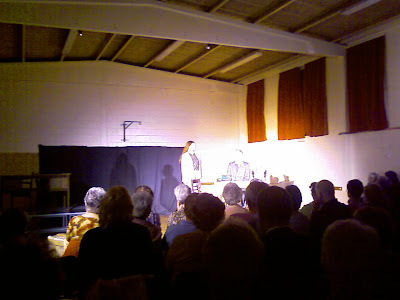 I went to visit a neighbouring parish this evening: the Ten Ten Theatre were performing Kolbe's Gift. It had been advertised in our parish as a Deanery event, and I had been lucky enough to snaffle a ticket before our parish allocation sold out. I very nearly didn't go: I'd had a long day at school, had missed lunch, was tired and aching (damp weather does this to me) and I was contemplating a meal out instead, or possibly a takeaway, but in the end, curiosity got the better of me. I'm very pleased that I changed my mind: the acting was superb (and the chap playing Kolbe was uncannily like him to look at) and I hardly noticed the time whizz by. The play was in two acts (I think... I'm not really into the terminology) with the first act concentrating on a brief "biography" of Kolbe and the events leading to his martyrdom. There were one or two scenes with the chap who was saved by Kolbe's heroic act: anyone unfamiliar with the story would have found the changes from one time period to another rather confusing: in my tired and befuddled state I took a while to cotton on, but soon got the hang of it. I am rather hampered by my preference for stories to progress in a linear fashion! 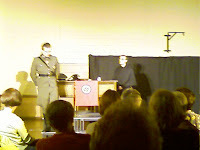 The end of the first act is Kolbe's death... several of the audience hadn't realised there would be an interval, and so when refreshments were announced, we were rather surprised at the abrupt "ending." 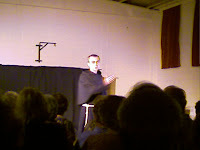 The second act concentrated on Franciszek Gajowniczek, the person saved by Kolbe, and his reaction to being saved. This was one of the most moving parts in a very moving play. Quite apart from the amazing story, the bit that brought tears to my eyes was the scene between a journalist and Franciszek. She was very hostile, and asked, in a sarcastic manner, what he'd done with his life since being saved by Kolbe. On finding out that he'd been a civil servant in the local town hall for twenty years ("err, twenty-one years" corrected Franciszek) the journalist asked why he had been saved by Kolbe, when Kolbe was such a great man, with such a fine intellect, and with so many achievements to his name, and all Franciszek had done with his life was to "push a pen around!" "Why you? What's special about you? He could have saved anybody..."
"That's precisely the point," Franciszek answered: "He could have saved anybody. He chose to save a nobody..."
"ten ten theatre exists to advance the social, moral, spiritual and cultural education of children, young people, young offenders, prisoners, teachers and the general public through drama and the performing arts. 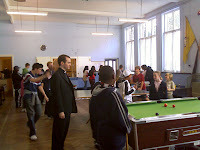 "We visit schools and community venues throughout the UK and are a non-profit-making company." I would heartily recommend seeing anything this group put on! UPDATE: Whatever was wrong with the links appears to have been ironed out, and both of them are now active. Information on Kolbe's Gift can be seen via the Ten Ten Productions link above, or directly from HERE. Anyway, what is a Mathete when it's at home? It seems to be a brand new award being passed out. It is the Mathetes Award, created by Dan King of Management by God to recognize those who take to heart the Great Commission and further God’s Kingdom by creating more disciples for Him. According to Dan, mathetes is the Greek word for "disciple". The rules for the award, as posted by its creator, are as follows: Winners of this award must pick five other "disciples" to pass it on to. As you pass it on, you are asked to mention and provide links for (1)the post Dan King of Management by God as the originator of the award, (2) the person that awarded it to you, and then (3) name and sites of the five that you believe are fulfilling the role of a disciple of Christ. Ok, not easy, as nearly everyone I know seems to have been "done"... apologies if you get double awards as a result! 5. My favourite Roman Neanderthal because he's cute. Enjoy, and spread it around a bit! !